Nothing much to see, but some how proof of progress after 4 months of summer hobbies seems like a big deal. Oil washes just going in, then sealing up the models with a mix of Johnson Klear and Tamiya flat. Then on to metallics which is a lot of gear, cables and arcane tehnomata. I paint the metallics after varnish for maximum oomph and matte to glossy contrast that has really worked with this project. 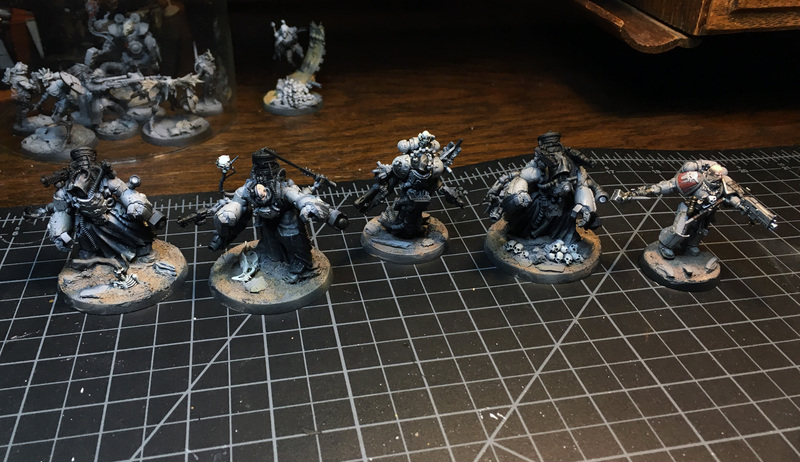 On the back ground, More Iron thralls and another Iron Priest inside their glass dome stasis, and a primed Eversor await. Very glad to see this project recalled to life. Loving these guys, very inspirational (and keen to get a look at the chaps in the background as well). Great to see new progress. The Iron Martians and the shield mounted thrall in the background looks awesome. Bring on winter tyme and more Vlka Fenryka! Stunning stuff, definitely going to follow this with keen interest. I agree with Wudugast about the chaps in the background as well. Previous Post Vlka Fenryka – One year in the Aett!